The older I get the more my memory is failing. The one thing I can not forget is September 11, 2001. It is as clear in my mind as what I just did five minutes ago. My children were all in school and my husband and I were at work. A worker from the next building came in to say that the tower had just been hit by a plane. Our initial reaction was calm as we thought, like many other people, that it was just a small plane that had tragically gotten off course. We connected to the internet to find that was not the case. Why, how, would a jet plane run into the tower. It was not until minutes later when the second jet hit that panic came over us. Panic such as where are my kids, where is my husband. We live so close to New York City at only a 20 minute car ride away. Were they safe at school, should I get them, should we leave town, where would we go? People in my town worked at the towers. My customers worked there. What was happening? So many questions, so much fear. Then the worst, the collapse of those beautiful towers that have graced our view of the city for all of my life. The people that were in there. The fear that my brother, who was a rescue worker in New Jersey, would be headed there to help. The fear that friends, neighbors would not make it out. The fear for my family on what may still come. Then we watched like the rest of America. Only here, where we live, we can actually see the smoke. We could see it, we could smell it. It stayed for days, weeks. Every time we walked out our door the smoke was present above the trees. Friends and neighbors were lost in 9/11. As a town, as in many towns close by, we prayed for them to be recovered, we prayed for the families. We watched as our beautiful skyline now had a void. 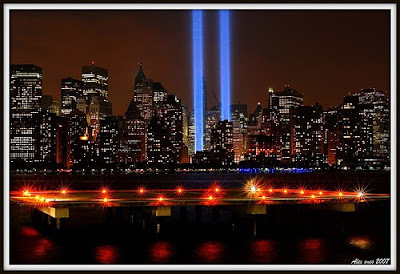 Those beautiful towers were gone and with them were the Americans who lost their lives that day. We must never forget.